Gun writers occasionally get to go to fancy events where manufacturers spend lavish amounts of money to debut a new firearm. I both enjoy and yet dread attending these events, for while I am as happy as anybody to eat free food and shoot other people's ammo, the question of how to write up the product can be tricky. What if the manufacturer spent all that money to wow a bunch of gun writers and the pistol turns out to be a big yawn? Nobody wants to participate in a celebration of mediocrity (or worse). It was with these concerns in mind that I took a trip to Springfield, Mass., this past March to visit Smith & Wesson. The S&W folks promised they had something really special to show us, and after signing a nondisclosure agreement, I know I wasn't the only writer there who hoped they had a product worth the buildup. They did. Offered in 9mm and .40 S&W, the new M&P Shield is designed as a thinner and lighter alternative to the proven M&P line. S&W has been broadcasting crime statistics as part of its big advertising push for the Shield, and if you didn't know that there are 12,000 carjackings every year in this country, or that someone is assaulted every nine seconds, then those are quite sobering statistics. Smith & Wesson believes the Shield is ideal for concealed carry. It has a 3.1-inch barrel and weighs 19 ounces empty. It has a 6.1-inch overall length, 4.6-inch height and 5.3-inch sight radius. As a pocket pistol it is pretty big and as a "belt gun" it is rather small, but what initially got my interest was how flat the Shield was. The Shield is narrower than a standard M&P in part because it isn't fed by a double-column magazine. Only 0.98 inch wide at its fattest point, the grip, with a frame that's 0.95 inch wide and the slide in many places narrower than that, the Shield is very thin for its size. From the side, the Shield's slide looks like a standard M&P slide, but that is not the case. Not only does it use a thinner magazine, the entire gun, including the slide, is thinner than a standard M&P. Don't let the fact that from the side it looks like a standard M&P Compact fool you; this is an entirely new gun. The M&P line is S&W's biggest-selling product and has been a huge success in the law enforcement market in particular. With the Shield, the company wanted to produce a small gun aimed not only at the rapidly expanding civilian CCW market but police officers as well. The goal was to design a small, easily concealable pistol suitable for plainclothes and off-duty officers that not only looked just like a full size M&P but functioned the same as well. To reach that goal, Smith & Wesson engineers designed the Shield to be tough enough to pass strict law enforcement test-and-evaluation standards. At the start of this project in July 2010, the company first obtained compact autos from Ruger, Taurus, Kahr and Kel-Tec, and tested them for accuracy, reliability and durability. They literally shot them until they broke, and then the S&W engineers sat down at their computers and built a gun that even cops would have a hard time breaking. Like its full-size M&P brothers, the Shield has a stainless steel barrel and Melonite-coated slide. The recoil spring guide rod is stainless steel as well. The magazine catch is reversible and has a steel insert. The Shield has the standard M&P three-dot steel sights and is rated for +P ammunition. To make it thinner than a standard M&P required some changes. The slide stop and manual safety are single-sided to keep the pistol slim. The Shield does not have the M&P's interchangeable backstraps; the grip profile is designed to imitate the medium-size backstrap of the M&P, which the people at Smith told me was the most popular size by far. The engineers thought including a manual safety was a good idea for a striker-fired pistol destined to end up in pockets and purses. The safety is small and stiff enough that if you don't want to use it, it won't get in the way or get accidentally engaged. I have no use for the safety, so my concern was whether it would accidentally get knocked to Safe bouncing around in a pocket or purse. I'm happy to report that the safety is flat and stiff enough that it is not going to get knocked on (or off) by accident. This is both good and bad. The Shield's safety is positioned where you'll see the safety on a 1911, but flipping off the Shield's safety with the side of your thumb on the draw stroke just isn't going to happen. You're going to need to use the tip of a finger. The Shield has no magazine disconnect safety and will fire with the magazine removed. This is as it should be for a gun of this type. The M&P Shield's magazine isn't a true single-column magazine. In fact, it is about a cartridge-and-a-half wide, except where it narrows at the top. I spoke to one of the engineers who told me they didn't go with a true single-column magazine to avoid issues with rim lock. This slightly wider magazine, however, allows for a little more capacity in a pistol that is a mere 4.6 inches tall. Each Shield is sold with two magazines, one with a flush base plate, the other an extended magazine with a grip extension. In 9mm, the magazines hold seven and eight rounds respectively, in .40 S&W six and seven rounds. With the flush magazine installed I can get all of my fingers (including half of my pinky) on the pistol, which is a huge plus. 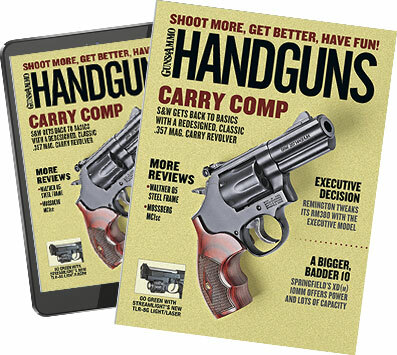 I have medium-size hands, and with the grip-extension magazine in place the grip felt nearly as long as a full-size M&P, even though it wasn't—perhaps because it's narrower. Smith engineers have improved the standard M&P trigger system for the Shield and reduced the reset. Even though the trigger pull weight is still the standard M&P 6.5 pounds, the trigger pulls on all the Shields I tried were cleaner than what I've come to expect on M&Ps. This newly designed trigger system will be making its way to the rest of the M&P line shortly. Aftermarket triggers designed for full-size M&Ps will not fit into the Shield. Remember, the Shield is designed to survive rigorous law enforcement testing. To that end, every pistol off the line is test-fired. One in every 300 to 500 guns produced goes through an extensive test, and every 1,500th gun produced is put through an exhaustive endurance test. The Shield admittedly isn't as small as most "pocket" pistols, but it is something they aren't: shootable. While visiting Smith & Wesson, over the course of two days I put a lot of rounds through a 9mm Shield. I discovered that it recoiled only slightly more than a full-size M&P. Honestly, it felt more like a full-size gun during shooting than a compact, and at one point I put 300 rounds through it in an hour without suffering a sore hand or wrist (most of it using the flush-fitting magazine). I don't think I could say the same thing if my Shield had been chambered in .40 S&W, but I have no problems with using a 9mm for personal defense. If nothing short of a .40 will do for you, don't fret, Smith is making one. The Shield is small and narrow enough that occasionally my thumb would bump the release lever and keep the slide from locking back on an empty magazine. I wasn't the only shooter who experienced this, but that's one of the problems you find with small guns. I took the Shield to my local club and let whoever wanted to put as many rounds through the pistol as they wanted. About half the shooters were able to get all their fingers on the pistol with the flush magazine in. Everyone commented not just on how accurate the pistol was (shotgun hulls at 10 yards were no challenge at all to people who had just picked up the gun) but also controllable. The experienced shooters in the crowd noted that even with +P loads, though recoil got a bit snappy, the front sight of the Shield went straight up and straight down. The Shield was big enough and accurate enough that I tested it for accuracy at 25 yards instead of my usual 15 for pocket guns. I've fed my Shield steel-cased ammo from Hornady and Black Hills in addition to an assortment of handloads and copious amounts of Federal ammunition. At least half the ammunition through this pistol has been hollowpoints, and I haven't had a single feeding issue because of it. At this point I have more than 700 rounds through the same Shield without cleaning it, and it shows no signs of stopping. That's a heck of a lot of rounds through a gun small enough to fit in a pocket (albeit a big pocket). Smith & Wesson didn't announce the Shield until mid April, when it had two months of inventory ready to ship (7,000 to 8,000 units). From everything I'm hearing that inventory isn't going to last two months, as Shields seem to be selling very well. My local gun store got in two Shields within a week of the pistol being announced, and they didn't last on the shelves more than a day or two. I already know someone whose carry gun is a brand-new Shield. S&W has also done a very smart thing and paired up early with numerous accessories manufacturers, and by the time you find a pistol you should be able to find holsters, sights, and/or lasers to fit the Shield from Galco, Blackhawk!, Crimson Trace, Hi-Viz, Uncle Mike's, Laserlyte, Fobus, LaserMax, DeSantis Gunhide, Pistol Wear and Williams Gun Sight Co. I had the opportunity to shoot Shields equipped with XS Big Dot sights as well, and that seems like a great pairing. Holsters designed to fit the Walther PPS appear to fit the Shield very nicely. To be honest, I have been looking to buy a subcompact auto for quite some time and just haven't been happy with what I could find. While I don't think the M&P Shield is perfect (I don't like the safety), it's the closest thing I've found to perfection in a gun this size, and I now own it. At a suggested retail of only $449, Smith & Wesson is sure to have a hit on its hands with the M&P Shield.